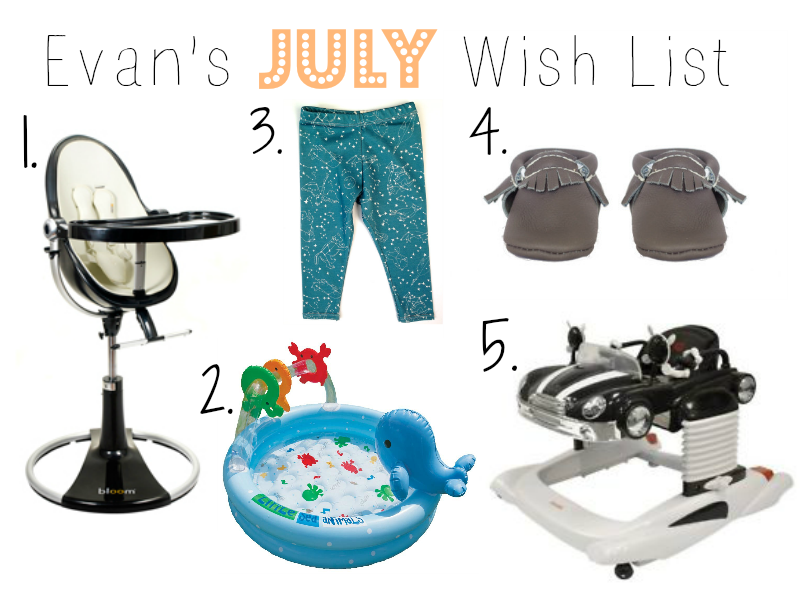 Nessa's World: July Wish List! 1. Evan still doesn't have a high chair. I have done so much research to find the perfect high chair and this is the winner. The Bloom Fresco high chair is a must have. It is pricey but I'm all about quality. I know this chair will last a long time (for my future babies). 2. It is officially Summer and Texas heat is killer. Evan defiantly needs a little pool so he splash and cool down on a hot Summer day! 3. I am discovering all these wonderful entrepreneur moms on Etsy. I am currently obsessing over these Salt City Emporium baby leggings. They are to die for. Each legging is handmade and from 100% USA grown organic cotton jersey. Every baby should own a pair. I am excited to try them out on Evan. 4. If you don't follow me on Twitter or Instagram then you don't know I'm officially obsessed with Freshly Picked Moccasins. We received our Butterscotch pair about a week and a half ago. Evan has been wearing them ever since. They match with everything! I want every color, but Smoke will be the next purchase for sure! 5. Evan is 7 and a half months and is officially crawling. I think it is time to get him a walker. I'm screaming of joy. Evan's dad really wants the Combi All in one activity walker in the color black. I think it's super cute and perfect for my little man.